In January, 2012, Kate Hennessy represented the project team in a workshop called "After the Return" at the American Museum of Natural History in Washington D.C. Mervin Joe was also scheduled to attend but was unfortunately kept at home by the famous Inuvik blizzard that damaged the roof of the Inuvik airport! 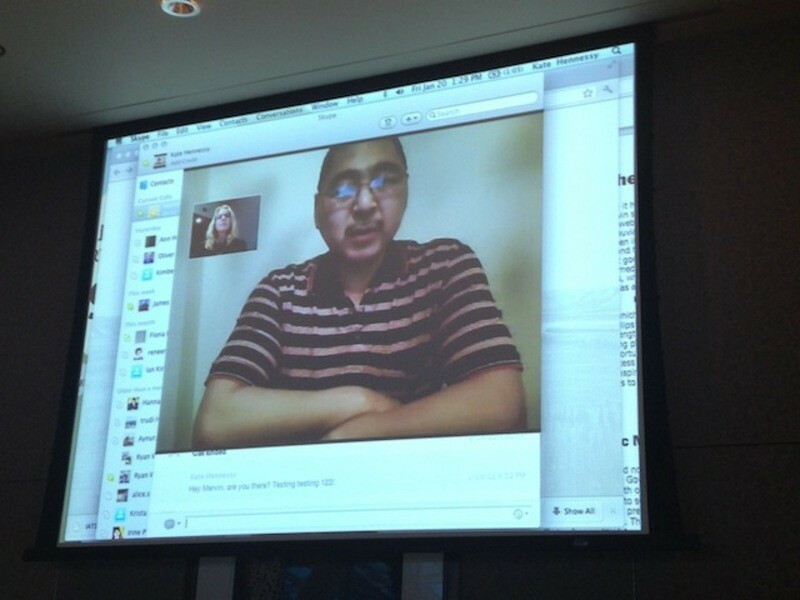 Luckily Mervin was able to Skype into the workshop to talk about his outreach work in the Inuvialuit Settlement Region and his work on the Inuvialuit Living History website. Kim Christen, a co-organizer of the workshop, wrote a great summary on the blog "Material World" about the workshop In addition to describing many of the fantastic presentations given in the course of the event, she talks about Mervin's virtual presentation. All in all it was a wonderful few days and we arereally looking forward to future collaborations and publications. Over the course of the workshop, participants explored and shared experiences of digital return projects focused on linguistic revitalization of endangered languages, cultural revitalization of traditional practices and the creation of new knowledge stemming from the return of digitized material culture from the Arctic to Arizona. Participants sought to understand the broad impact of such technological changes and cultural needs on individual communities as well as regional and international networks. Enote’s keynote moved deftly from a narrative about his grandmother’s humility to the necessity of tribal control and ownership of digital materials. He emphasized the generative possibilities of new media and the necessity of tribal involvement from the ground up. Echoing Enote’s sentiments Victoria Wells and Peter Brand shared their experiences with the First Voices language tool suite. With practical advise and examples of technological necessities and cultural needs, Wells and Brand showcased how tribal involvement leads to flourishing language programs on the ground in First Nations communities. Guha Shankar from the Library of Congress Folklife Center similarly began with the necessity of tribal involvement, but highlighted the many institutional and tribal roadblocks along the way of any project. Shankar emphasized the need for open channels of communication and multi-leveled approaches to digital return projects. Giving the audience a taste of what multi-institutional projects involve, Sue Rowely documented the last five years of wok creating the Reciprocal Research Network. Rowley’s talk supported the call for tribal involvement while also emphasizing the technical support needed across institutions and the long-term goals of network integration necessary to support larger projects. On day two, highlights included a Skype conversation with Kate Hennessy in D.C. and Mervin Joe from Inuvik where a blizzard stranded him prior to the workshop. Joe discussed his work with Hennessy and the Smithsonian Arctic Studies Centre on the Inuvialuit Living History project where he worked directly with youth and elders to expand on a set of digital collections returned from the Smithsonian Institution. The project highlights Inuvialuit perspectives and cultural traditions. The second half of the day focused on discussions of intellectual property rights issues from Jane Anderson and Rosemary Coombe. While Anderson touched on her recent work drafting traditional knowledge licenses and labels for the Mukurtu project, Coombe moved from international indigenous movements to the need for larger sets of policies that could unite the work of indigenous communities while also leaving open the possibility of multi-pronged solutions including a fundamental rethinking of IPR in relation to digital heritage. Moving forward from this stimulating workshop, participants are now collaborating on a special issue of Museum Anthropology Review, developing themes raised at the workshop, including access and accountability, intellectual property rights and intangible cultural heritage, digital technologies and community collaboration and the circulation and transformation of knowledge through new digital networks and multiple publics. The Digital Return website will be expanding to include both research network and community resource links to promote discussion and provide resources for communities, institutions and researchers. Finally, participants will be exploring further grant opportunities to link cultural materials and digital tools with communities, particularly through the Recovering Voices initiative of the National Museum of Natural History, the Mukurtu indigenous archive tool and the World Oral Literature Project based at Cambridge and Yale universities. For a full list of participants, their projects and the workshop presentations please visit the Digital Return website.